So you're a renter and you want to green your space, but your landlord won't splurge on solar panels. Don't fret. There are plenty of low-cost ways for apartment dwellers to be eco-friendly. You can be a green tenant by unplugging appliances or using chemical-free products. It's as easy as fixing leaky faucets or installing window treatments to conserve heat in the winter and to keep your place cool in summer without cranking up the air conditioning. "There's a myth that there isn't a lot that renters can do," said Paula Cino, director of Energy and Environmental Policy with the National Multi Housing Council. "Our individual behavior has a huge impact on sustainability. The resident has a lot of opportunity to make big differences themselves without any input from the landlord whatsoever." Take it from Colin Beavan. The 46-year-old New York writer embarked on a yearlong experiment to see how much he could shrink his environmental footprint. He used candles instead of electric lights. He gave away his air conditioner. He unplugged his freezer and reduced his trash production. Beavan chronicled his efforts on a blog, No Impact Man. In addition to cutting his power bills, he figures he and his family eliminated 4,000 gallons of garbage that would have otherwise ended up in dumps. "The problem for apartment dwellers is that you can't change the infrastructure of the building," he said. "So it comes down to using less." Americans are consumers to the core, rapidly accumulating and discarding belongings that gobble up energy as they're manufactured, delivered and then eventually dumped into landfills. "Many of us have just been flying through things, purchasing at alarming rates and making no commitment to the things we already have," said Wanda Urbanska, author of "The Heart of Simple Living." "People have not considered that purchasing all new products involves a heavy carbon cost," she said. But the recession stopped some people in their consumerist tracks. Enter green renters like Leslie Gant, 27. "I don't have the budget to get a Prius, so I use all the other little things to make a difference," said Gant, whose airy, split-level condo in Westwood is filled with reused and recycled items. "It's not difficult at all," said Gant, who shares the 900-square-foot space with a roommate. "It's fun for your inner scavenger. Oh, and it gives me peace of mind." 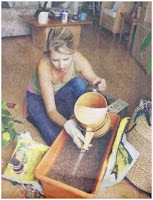 To preserve trees, she stocks her bathroom with toilet tissue made from recycled paper and cleans with old rags. If every household in the nation swapped just one roll of traditional toilet paper for a recycled roll, the effort could save 424,000 trees, according to the Natural Resources Defense Council. The environmental group has created a shoppers' guide to recycled-paper products. For tenants whose buildings don't participate in a recycling program, Earth911.com lists local recycling collection centers. And if you're moving, Rent a Green Box of Costa Mesa offers packing crates made from recycled plastic bottles and old cereal boxes. But reusing materials doesn't have to be a utilitarian endeavor. Make your music sound sweeter by using sustainable stereo speakers, some of which are made with old sliding door casings. OrigAudio makes a set using recycled newspapers, phone books and pizza boxes, and the Bon Eco Subwoofer 500 is made from old tires and wheat straw fiber. Water requires energy. Lots of it. Pumping it, transporting it, irrigating with it, heating it and treating it consume billions of kilowatt-hours of electricity in the U.S. each year. Producing all that power creates carbon dioxide, the equivalent of 4 million cars, according to the Natural Resources Defense Council. For starters, collect your old bath water or dishwater. Known as gray water, it can be used to water houseplants or for outdoor irrigation. But you'll want to use only natural, biodegradable soap to keep from harming your greenery and to keep chemicals from leaching into the water table. Then there's the toilet. Flushing accounts for about 30% of the water consumed in an average home, according to the Environmental Protection Agency. Gant the recycler flushes sparingly. If that's too indelicate for you, try a trick used by Sarah Masson, 25, of Los Feliz. The television writing assistant placed a 2-liter soda bottle filled with water in her toilet tank to displace some of the water, reducing the amount used in each flush-refill cycle. You can also buy a bigger float ball or adjust the existing one so that it rests closer to the bottom of the tank, shutting off the refill valve earlier. Monitors such as the ShowerTime from Efergy and the Waterpebble track the amount of water you've used in the shower and set off an alarm when you reach a pre-set limit. Your 700-square-foot pad probably isn't equipped with solar panels or a wind turbine generator. But chances are your power company is generating a portion of its electricity with clean sources of energy. You can tap into those renewables — though it might cost you a little extra. That's because clean power often costs more to generate than electricity from conventional sources such as coal or natural gas. To pay for it, some utilities are offering opt-in programs for ratepayers who wish to support clean power investments through a small surcharge on their monthly bills. The extra cost is worth it to Tracy Hepler. The 26-year-old founder of the online sustainable living magazine YourDailyThread.com paid an extra $9.39 every two months at her one-bedroom Fairfax apartment to support the Los Angeles Department of Water and Power's green energy program. She's planning to sign up for a similar program at her new Santa Monica apartment. More than 750 utilities across the country now offer similar options, according to the U.S. Department of Energy. Another tactic: Find out which appliances are the biggest power consumers in your apartment with an energy audit, which public utilities usually offer free (hint: refrigerators are major energy hogs) and consider replacing them with energy-efficient models, even if your landlord won't cover the swap. Even when they're switched off, most home appliances and electronic devices continue drawing a little bit of power as long as they're plugged in. These "vampires" account for an estimated 10% of residential energy use in the U.S. Shedding these leeches is easy. Simply unplug the stuff you don't use most of the time. Make it easy on yourself by plugging clusters of devices into a single power strip that can be switched on and off. Some "power towers" automatically sense voltage dips when attached devices go into sleep mode and adjust output accordingly, lowering standby power use by up to 85%. And you don't need to own the roof over your head to install solar panels. Companies like Veranda Solar are developing panels that can hang from your window ledge or clip on to gutters and balconies. The systems are smaller and more portable than traditional installations and, at less than $1,000, a tiny fraction of the price. Even easier, replace burned-out incandescent light bulbs with compact fluorescent bulbs, which use about 75% less energy. Now that you've done what you can to green your space, here comes the hard part: greening your landlord. Apartment owners these days are in penny-pinching mode and aren't likely to spring for environmental improvements — unless you can show them how they too can save money by doing it. "That's something they're very responsive to," Cino said. Some tenants are now pushing for so-called green leases — a contract that would lay out how renters and apartment owners split the cost of eco-friendly upgrades. Ask your complex to swap out inefficient outdoor lights with ones activated by motion sensors, install timers for sprinklers and replace old appliances with Energy Star-rated products. Persuade your landlord to caulk and tint windows and add programmable thermostats to get the most out of air conditioning and heaters. And setting up a barrel to catch rainwater from gutters and downspouts isn't difficult. The city of Los Angeles is considering expanding a popular program from last year that installed free 55-gallon barrels. Basic eco-upgrades to a 900-square-foot apartment can cost just $150, said Doug Walker, senior vice president of UDR Inc., a Colorado-based multifamily real estate investment trust. Chemical-free paints and adhesives now cost no more than their traditional competitors, he said. Managers at the Park La Brea apartments are overhauling the decades-old property with low-emission water heaters, recycled nylon carpet and drought-tolerant landscaping. They painted the roof of one building white to reflect sunlight and help keep the upper floors cool. They're now weighing the cost of installing solar panels and retrofitting laundry rooms to divert wastewater for irrigation. "It's a challenge with an older complex in Los Angeles that's rent stabilized," general manager Ron Bowdoin said. "The ability to pass costs on to residents is very limited." But in a time of high vacancy rates, landlords are also more inclined to make their tenants happy, said Annie Argento, the Southern California director for sustainability consulting firm Brightworks. "There is economic payback here in the form of tenant retention, quicker lease-up rates, etc.," she said. "It's just looking at the equation from a broader perspective."